"What did you say, my boy? It's all over. It's all over. That's what you said. No, but it isn't all over. It's far from being all over!" OK, we're still on DVD for this episode, but this isn't a film recording of the episode. That's missing. This episode has been animated for The Tenth Planet DVD but I'm sticking with the earlier reconstruction for the VHS, which is also on the DVD in amongst the Special Features. This takes the Soundtrack and marries it to the Telesnaps taken by John Cura, incorporating a small amount of 8mm footage plus a film clip taken from a 1973 edition of Blue Peter. I'm of the distinct opinion that where a Telesnap reconstruction is possible then it's closer to the original episode than animation. The Z-Bomb Rocket's engines fail, throwing Cutler into a rage, blaming the Time Travellers Ben & Polly and Barclay who helped them. The Doctor returns to the control room, feeling somewhat better. Last episode had no Hartnell, who had been taking ill with bronchitis, and very little of the Cybermen. There was a distinct feeling it was poorer for both their absences. Hopefully this, the final episode featuring the First Doctor, can do better. When contact with Zeus-5 is lost Cutler presumes his son is dead and decides to have all four of them killed. RADAR: Sir, Cyberman ship on descent now! DYSON: Radio dead. It's hopeless. BARCLAY: The enemy will landing at any moment. CUTLER: The enemy! The enemy! I'll tell you who the enemy is. You are the enemy. You. RADAR: The Cybermen, sir. They must have landed. CUTLER: You, you, you, you killed my son! DYSON: But, sir, they've landed! CUTLER: The only person I gave a care about in this whole world, and you killed him. So now I'm going to kill you and I'll start on you, Doctor. The crew of the third Cyberman ship storm the base and kill Cutler. The Doctor tries to negotiate with the Cybermen. KRANG: Silence. Anyone who moves will be killed instantly. DOCTOR: We owe you our lives. That man was going to have us shot. KRANG: Go with the others down there. BEN: There's gratitude for you. We save their grotty planet Mondas for what. KRANG: Saved Mondas? We do not believe you. We have seen a rocket missile aimed at Mondas. DOCTOR: That is so. We prevented it being fired at you. We helped you. Therefore, I suggest you help us. BEN: It's no use talking to these geezers. KRANG: And what do you ask in return for this? DOCTOR: Your planet is finished. It will disintegrate. We know why you came here, so why not stay and live with us in peace? KRANG: We will confer. Keep your places. Anyone who moves will be killed instantly. Roy Skelton continues to provide the Cybermen voices for this episode but he's assisted by Peter Hawkins who has provided the Dalek voices since their first appearance. KRANG: We cannot talk while that missile is aimed at Mondas. It must be disarmed first. DOCTOR: A moment, please. Are you able to disarm this rocket? DOCTOR: It will give us the time we need. BEN: The time for Mondas to burn itself out, you mean? DOCTOR: Yes, now quiet! We accept your terms. The warhead will be removed from the rocket. KRANG: It must be removed to below ground level. BARCLAY: Well, there's the radiation room. It's the deepest in the base. KRANG: That will do. And to make sure you do this, we will take two hostages. That girl will go to the spacecraft. You will stay here with us. You three must go to the rocket. DOCTOR: You must do as they say. BEN: Look, if you want a hostage, what about me? KRANG: You are needed to help with the warhead. They take Polly as a prisoner to their spaceship as insurance while Ben, Barclay and two of the base crew, Haines & Dyson, deactivate the Z-Bomb. The Cybermen take control of International Space Command in Geneva. WOMAN: Geneva calling South Polar base. Geneva to South Pole. WOMAN: Geneva calling South Polar base. Geneva to South Pole. Geneva to South Pole. Geneva to South Pole. WOMAN: Secretary Wigner to speak with General Cutler. DOCTOR: I'm afraid the General isn't here at the moment, and, er, I've been put in charge temporarily. WIGNER: Who is that speaking? DOCTOR: I have no time to discuss it now, sir. WIGNER: Tell General Cutler there have been mass landings of Cybermen in many parts of the world. Who are you? GERN: I am now Controller of the Earth. Resist us and you die. You must proceed with your second objective. KRANG: We are proceeding according to plan. GERN: Report to me as soon as you are ready. We must have time to evacuate. KRANG: Unit Delta plus calling. Unit Delta plus calling. Unit Delta plus calling. DOCTOR: I do not understand your friend, sir. Evacuate? Surely you're not going to return to Mondas now? KRANG: We will not discuss our plans with you. DOCTOR: What is your second objective? It's quite obvious, isn't it? The destruction of the Earth! Ben! Barclay! Do not help them. They're going to use the Zed-bomb to destroy the Earth! Ben & Barclay observe that the Cybermen aren't entering the reactor room and figure the Cybermen are susceptible to radiation. BEN: Quick! All look busy. Bring in number two line! Half a mo. The Doctor told us to play for time, right? And I've got an idea. BEN: Well, you might at least hear it. I don't hear any bright suggestions coming from you two guys. BEN: Well, any idea how strong these Cybermen are? BEN: Yeah, well, they could lift a man like he was well, like he was a wrench, right? BEN: Well, they're also pretty advanced geezers, way ahead of us. DYSON: What has this got to do with it? BEN: Well, that just it. With all this, why should they need us? Well, they could shift that bomb in half the time, so why get us to do it? Also, you notice they remain outside this door, looking at us all the time through the door. Well why? DYSON: This is just a waste of time. BARCLAY: No, wait a minute, I think I see what he's driving at. They use us because they daren't handle it themselves. BEN: Yeah, but the point is, why? Well, you're the scientists. BARCLAY: Don't you see, Dyson? It could that they're afraid of radioactivity. The Cybermen are displaying the first in a long line of weaknesses. It's Radiation here, the more familiar Gold is some nine years in the future of the program in Revenge of the Cybermen and they'll be a few more in-between including Gravity, in The Moonbase, and Emotional Stimulus, in The Invasion and recently reused in The Lodger. They test the theory on the guard outside the door gaining his weapon and refusing to further co-operate. We'd had a little "heads up" that the reactor would feature in the plot during episode two when they talk about the moderator rods have being removed. Here it's the fuel rods that are extracted and used as weapons. KRANG: Listen to me. This close proximity of our two planets means that one has to be eliminated for the safety of the other. The one to be destroyed will be Earth. We cannot allow Mondas to burn up. If you help, we will take you all back to Mondas with us. There you will be safe. The Doctor too is taken to the Cyberman ship. The remaining Cybermen are lured into the depths of the base where they are killed by the radiation from the base's reactor. Returning to the control room, they find the base stormed again by yet another party of Cybermen. We've seen a Cyberman weakness earlier in the episode but they also show a major strength here: the shear number of Cybermen that there are. Get rid of one lot and another load turn up. The base gets invaded by FOUR waves of Cybermen during the course of the story! SHAV: Resistance is useless! Drop your weapons. RADAR: Just look at Mondas, sir. I can't believe it! DYSON: Fantastic! It looks as if it's melting! BEN: It's falling to bits! What did you say, my boy? It's all over. It's all over. That's what you said. No, but it isn't all over. It's far from being all over! He stumbles through the snow to the Tardis locking the door behind him. Ben & Polly hammer on the door as the Doctor sets the Tardis controls. He opens the doors to admit them just before he falls to the floor unconscious. The Tardis dematerialises as the Doctor is enveloped in light and begins to change. As the light fades a shorter, younger man lies on the Tardis floor. Wow. That's a great episode, so much better than the third. Can we swap our copy of Episode Three for a copy of Episode Four please? Lots of Cybermen in this which helps lots but the Cybermen are almost secondary here to what happens at the end of the episode. 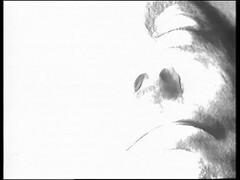 The Doctor was shown weakened during the last episode, and on his return he attributes this to the energy drain from Mondas. But this is the third such experience the Doctor has had recently after the ageing effect of the Time Destructor in Dalek Masterplan and his exposure to the Transference Process in the Savages. You'd almost feel the production staff had been planning this for sometime and dropping hints to the viewer. The reality is quite different. Although there had been a previous plan to replace William Hartnell in the end his departure was a relatively quick affair. Producer John Wiles and Hartnell had never got on, but his plan to replace Hartnell at the end of Celestial Toymaker was vetoed by his BBC bosses and is probably a factor in him tendering his resignation soon afterwards. 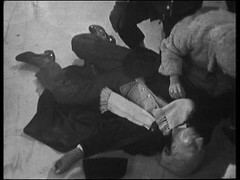 Hartnell's health and on set behaviour deteriorated throughout the third season of Doctor Who: he was already suffering from arteriosclerosis which was affecting his memory, and thus his ability to learn lines. New producer Innes Lloyd gained permission to replace Hartnell from a new & different set of bosses that had refused Wiles' request. Hartnell & Lloyd spoke during the filming of the Smugglers, the last story filmed in the show's third recording block, and Hartnell agreed that the time had come to leave but would return for one last story. Hartnell told his wife Heather on July 16th 1966 and the decision was announced to the press on August 6th. Following his departure he returned to the stage in pantomime, and it was there that he gave an interview which was uncovered in 2013 and placed on The Tenth Planet DVD. He undertook three further television acting roles in No Hiding Place - The Game (1967), Softly, Softly - Cause Of Death (1968) and Crime Of Passion - Alain (1970) before being approached to reprise his role as the First Doctor in 1973's The Three Doctors. William Hartnell died, aged 67, on 23 April 1975 of heart failure following a series of strokes. So what did happen to Tenth Planet Four? For many years the myth was put about that Blue Peter lost it when they borrowed a copy for the program they did on Doctor Who's 10th anniversary in 1973. This appears to be false, the program that they lost was the BBC Film & Video library's copy of Dalek Masterplan 4. Blue Peter borrowed Tenth Planet 4 from BBC Enterprises, who were still offering this story for overseas sale at the time and was doing so through 1974 as existing paperwork shows. In 1977, when Ian Levene visited the Film & Video library, they had parts 1-3 of the Tenth Planet. The assumption is that these three episodes came to them from BBC Enterprises. What had happened to the fourth part? You can construct all sorts of theories (including Blue Peter loosing it, Enterprises not realising till later and then dumping the three remaining episodes, now useless to them for overseas sales, on the the Film & Video library) but we'll never know for sure. Because of this all sorts of rumours & hoaxes have sprung up over the years concerning this episode. The only footage that survives from the episode is the material that Blue Peter broadcast in 1973 which consists of the regeneration sequence from the end of the episode. A small amount of 8mm film of the episode was recorded by a fan pointing his camera at the television screen, and several people made audio recordings of the episode. As was common at the time, John Cura took "Telesnap" photos of the episode as a permanent record. All these were put together by the BBC during 2000 to form a reconstruction of the episode which was released on video with the remaining three episodes & Attack of the Cybermen as part of Doctor Who - Cybermen: VHS Boxset. The soundtrack was released in the BBC Missing Episodes collection, first in a special tin with The Invasion then later individually and finally in Doctor Who Collection Three: The Lost TV Episodes volume 3: 1966-1967. The next episode we'll properly watch then is the relatively recently returned Underwater Menace 2. This is currently the longest run of episodes which don't exist at the BBC. The next longest run of missing episodes is 8, between Web of Fear 6 and Wheel in Space 3. Tenth Planet was the first William Hartnell/First Doctor novel commissioned by Target books as part of their range, having previously reissued the three Doctor Who Books written in the Sixties: The Daleks & The Crusade, both by David Whitaker, and the Zarbi written by Bill Struton. It was novelised by Gerry Davis, who restored some material to the third episode which was cut when Hartnell was taken ill. The eight year old me, faced with a choice between buying either the novelization of the Tenth Planet or Dalek Invasion of Earth, neither of which I'd seen before, had a complete melt down in the WHS in Richmond! I chose Tenth Planet. Mum sneaked back and bought Dalek Invasion which I was given as a present much later. The book was One of a number reissued by the BBC 2013 and is also available for the Kindle. So we reach the end of Hartnell's reign. In some ways it's different to any other era of Doctor Who with historical stories and more experimental science fiction tales. Towards the end of the reign you get a feeling that the Doctor Who we're more familiar with is starting to emerge. Both of my favourite Hartnell tales, War Machines and Tenth Planet appear then but War Machines is effectively a prototype Pertwee story and Tenth Planet is the template for many a Troughton tale so neither is a typical Hartnell tale, if such a thing exists. Of the Historical stories I've always like Reign of Terror, but enjoyed the Gunfighters and the Smugglers this time round. Of the science fiction tales I think, barring the two I've already mentioned, that The Dalek Masterplan and Galaxy Four are the best. The story I've changed my opinion on the most during this viewing session is The Gunfighters which I now see in a different light entirely, with Keys of Marinus & Web Planet both improved but each let down by at least one episode. Oddly the story which I think has gone down the most in my eyes is Tenth Planet. Part Three is a real let down with no Doctor and no Cybermen, and while the rest is decent it's reputation and my liking of it is more built on the number of things it does for the first time. I still love the Tenth Planet style Cybermen though! Worst story? 2 contenders and they're both boring snore fests: The Sensorites and The Space Museum. I didn't get on with The Massacre or The Crusade (and to a lesser extent Marco Polo) but I can see that those three are competent historicals whereas the other two are just so boring. Likewise although Edge of Destruction is nonsense at least there's something happening!. Best Episode? Easy: The first one, An Unearthly Child. Fabulous. Honourable mentions to both of the pioneering London location episodes: Dalek Invasion of Earth 1 and War Machines 1. Next Week we start the reign of Patrick Troughton as the Second Doctor. And what better way to launch a new Doctor than to bring your best monsters back? Join us next Saturday for The Power Of The Daleks.